The famous Rocky Mountains stretch all the way down the West of the country, providing a myriad of opportunities to explore Canada’s rugged scenery at its best. 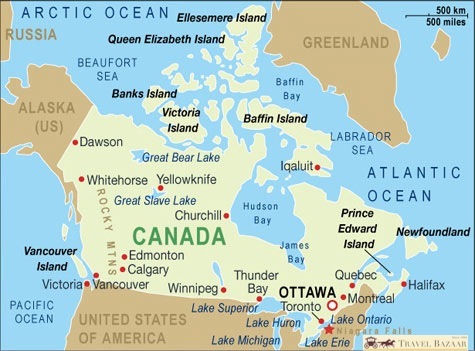 The Inuit territory of Nunavut in the far north with its icy landscape will captivate the most hardened of travellers, as will the beautiful, unspoilt beaches of Prince Edward Island. If you want to get away from it all, this is surely one of the best places in which to do so. It’s not all hiking and roughing it in the great outdoors, though. If you’re more of an urban dweller, Canada has its fair share of sophisticated cities. Montreal is one of the most attractive, with its bohemian atmosphere and lively nightlife. Toronto is equally worth visiting for its art galleries and excellent restaurants. Or Vancouver offers the best of both worlds: a stylish city with beautiful parks, beaches and wide, open spaces. One point bearing in mind when planning any trip to this vast country is the enormous distances involved in travelling. It would be foolish to even attempt to see the whole country in a couple of weeks, as you would spend hours in a plane or car. Unless you have an inordinate amount of time on your hands, it is probably best to concentrate on one area to get the most out of your trip. Wherever you decide to go in Canada, though, you will never be far away from breathtaking natural beauty, combined with an intriguing cultural heritage and friendly people.